SSC JE 2017-18 Admit Card Central Regions Releases - Download Now call letter/hall tickets from official link. Staff Selection commission has officially released Call letter and Hall tikets for Central region SSC jun ior Engineer examination. 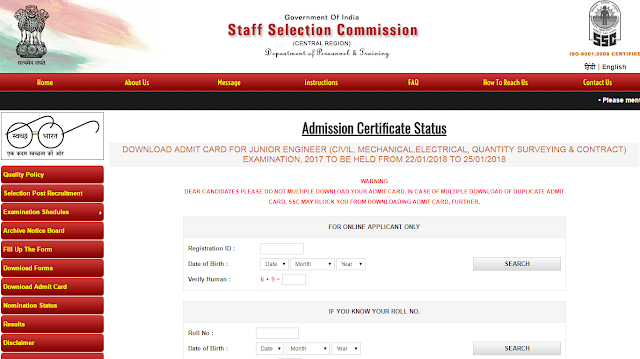 Get SSC JE 2017 On line Admit card released for Central Region(CR) candidates applied for SSC JE Recruitment. You can download your Admit Card from the respective CR regional websites. SSC NWR has released officialy link to check application status online , click on below given link for SSC north west region. All The best for SSC JE examination.